SEVEN WATER PROTESTERS accused of falsely imprisoning Joan Burton have told a court they will not speak about the trial at an upcoming protest rally. 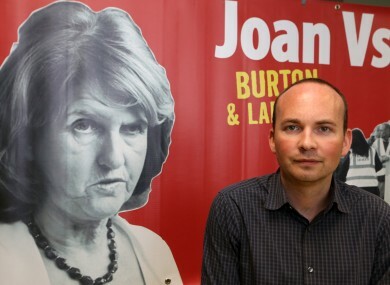 Solidarity TD Paul Murphy (33), together with Dublin councillors Kieran Mahon (39), Michael Murphy (53) and four other men are due to go on trial next month on charges arising out of the alleged false imprisonment of then Tánaiste during a water protest in Jobstown on 15 November 2014. The case was listed today after the Director of Public Prosecutions (DPP) told Dublin Circuit Criminal Court on Thursday it had concerns about a campaign in respect of the trial and a rally being held in the city this weekend. Sean Guerin SC, defending Paul Murphy, said his client was prepared to make an undertaking to the court that he would not speak on the subject matter of the trial during this rally. He said also that the raising of the issue had given the defendants time to reflect on the limits on the freedom of expression around a forthcoming trial. He told the court that Murphy had been on bail for 18 months since he was charged and during this time no issues had ever arisen. Lawyers for the other accused told the court their clients had instructed them to give the same undertaking as Murphy. Judge Melanie Greally said she was relieved to see that such a responsible position was being adopted by the accused. Sean Gillane SC, prosecuting, told the court that on the day the jury panel arrives, the accused and the supporters should take into consideration the fact that the courthouse had only one way in. Some supporters in the packed courtroom began shouting “no” and “no way” to this. Judge Greally said she didn’t know what these exclamations were about. “But I can assure you that anybody present here who is seen acting in any way seen intimidatory of likely jurors or actual jurors will be met with the most severe of consequences,” she said. The trial is due to begin on 24 April when a jury will be selected. The court heard that there is some consideration for having a specially enlarged jury panel if the trial will take a number of months but that this will be unnecessary if the trial runs within the scheduled six weeks. Email “Paul Murphy promises he won't talk about his upcoming trial at Jobstown protest rallies”. Feedback on “Paul Murphy promises he won't talk about his upcoming trial at Jobstown protest rallies”.